The content in the 'hooks' section of the AppSpec file varies, depending on the compute platform for your deployment. The 'hooks' section for an EC2/On-Premises deployment contains mappings that link deployment lifecycle event hooks to one or more scripts. The 'hooks' section for a Lambda or an Amazon ECS deployment specifies Lambda validation functions to run during a deployment lifecycle event. If an event hook is not present, no operation is executed for that event. This section is required only if you are running scripts or Lambda validation functions as part of the deployment. An AWS Lambda hook is one Lambda function specified with a string on a new line after the name of the lifecycle event. Each hook is executed once per deployment. Following are descriptions of the lifecycle events where you can run a hook during an Amazon ECS deployment. BeforeInstall – Use to run tasks before the replacement task set is created. One target group is associated with the original task set. If an optional test listener is specified, it is associated with the original task set. A rollback is not possible at this point. AfterInstall – Use to run tasks after the replacement task set is created and one of the target groups is associated with it. If an optional test listener is specified, it is associated with the original task set. The results of a hook function at this lifecycle event can trigger a rollback. AfterAllowTestTraffic – Use to run tasks after the test listener serves traffic to the replacement task set. The results of a hook function at this point can trigger a rollback. BeforeAllowTraffic – Use to run tasks after the second target group is associated with the replacement task set, but before traffic is shifted to the replacement task set. The results of a hook function at this lifecycle event can trigger a rollback. AfterAllowTraffic – Use to run tasks after the second target group serves traffic to the replacement task set. The results of a hook function at this lifecycle event can trigger a rollback. The Start, Install, TestTraffic, AllowTraffic, and End events in the deployment cannot be scripted, which is why they appear in gray in this diagram. The following are examples of the structure of the 'hooks' section. Use the 'hooks' section to specify a Lambda function that CodeDeploy can call to validate a Lambda deployment. You can use the same function or a different one for the BeforeInstall, AfterInstall, AllowTestTraffic, BeforeAllowTraffice, and AllowTestTraffic deployment lifecyle events. Following completion of the validation tests, the Lambda AfterAllowTraffic function calls back CodeDeploy and delivers a result of 'Succeeded' or 'Failed'. If CodeDeploy is not notified by the Lambda validation function within one hour, then it assumes the deployment failed. The following is a sample Lambda hook function written in Node.js. //Read the DeploymentId from the event payload. // the lifecycleEventHookExecutionId for AWS CodeDeploy. // Pass AWS CodeDeploy the prepared validation test results. An AWS Lambda hook is one Lambda function specified with a string on a new line after the name of the lifecycle event. Each hook is executed once per deployment. Following are descriptions of the hooks that are available for use in your AppSpec file. BeforeAllowTraffic – Use to run tasks before traffic is shifted to the deployed Lambda function version. 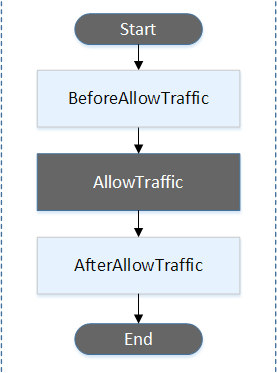 AfterAllowTraffic – Use to run tasks after all traffic is shifted to the deployed Lambda function version. The Start, AllowTraffic, and End events in the deployment cannot be scripted, which is why they appear in gray in this diagram. Use the 'hooks' section to specify a Lambda function that CodeDeploy can call to validate a Lambda deployment. You can use the same function or a different one for the BeforeAllowTraffic and AfterAllowTraffic deployment lifecyle events. Following completion of the validation tests, the Lambda validation function calls back CodeDeploy and delivers a result of 'Succeeded' or 'Failed'. An EC2/On-Premises deployment hook is executed once per deployment to an instance. You can specify one or more scripts to run in a hook. Each hook for a lifecycle event is specified with a string on a separate line. Following are descriptions of the hooks that are available for use in your AppSpec file. For information about which lifecycle event hooks are valid for which deployment and rollback types, see Lifecycle Event Hook Availability. ApplicationStop – This deployment lifecycle event occurs even before the application revision is downloaded. You can specify scripts for this event to gracefully stop the application or remove currently installed packages in preparation of a deployment. The AppSpec file and scripts used for this deployment lifecycle event are from the previous successfully deployed application revision. An AppSpec file does not exist on an instance before you deploy to it. For this reason, the ApplicationStop hook does not run the first time you deploy to the instance. You can use the ApplicationStop hook the second time you deploy to an instance. /opt/codedeploy-agent/deployment-root/deployment-instructions folder on Amazon Linux, Ubuntu Server, and RHEL Amazon EC2 instances. C:\ProgramData\Amazon\CodeDeploy\deployment-instructions folder on Windows Server Amazon EC2 instances. To troubleshoot a deployment that fails during the ApplicationStop deployment lifecycle event, see Troubleshooting failed ApplicationStop, BeforeBlockTraffic, and AfterBlockTraffic deployment lifecycle events. /opt/codedeploy-agent/deployment-root/deployment-group-id/deployment-id/deployment-archive folder on Amazon Linux, Ubuntu Server, and RHEL Amazon EC2 instances. C:\ProgramData\Amazon\CodeDeploy\deployment-group-id\deployment-id\deployment-archive folder on Windows Server Amazon EC2 instances. This event is reserved for the CodeDeploy agent and cannot be used to run scripts. To troubleshoot a deployment that fails during the DownloadBundle deployment lifecycle event, see Troubleshooting a failed DownloadBundle deployment lifecycle event with "UnknownError: not opened for reading". BeforeInstall – You can use this deployment lifecycle event for preinstall tasks, such as decrypting files and creating a backup of the current version. Install – During this deployment lifecycle event, the CodeDeploy agent copies the revision files from the temporary location to the final destination folder. This event is reserved for the CodeDeploy agent and cannot be used to run scripts. AfterInstall – You can use this deployment lifecycle event for tasks such as configuring your application or changing file permissions. ApplicationStart – You typically use this deployment lifecycle event to restart services that were stopped during ApplicationStop. ValidateService – This is the last deployment lifecycle event. It is used to verify the deployment was completed successfully. BeforeBlockTraffic – You can use this deployment lifecycle event to run tasks on instances before they are deregistered from a load balancer. To troubleshoot a deployment that fails during the BeforeBlockTraffic deployment lifecycle event, see Troubleshooting failed ApplicationStop, BeforeBlockTraffic, and AfterBlockTraffic deployment lifecycle events. 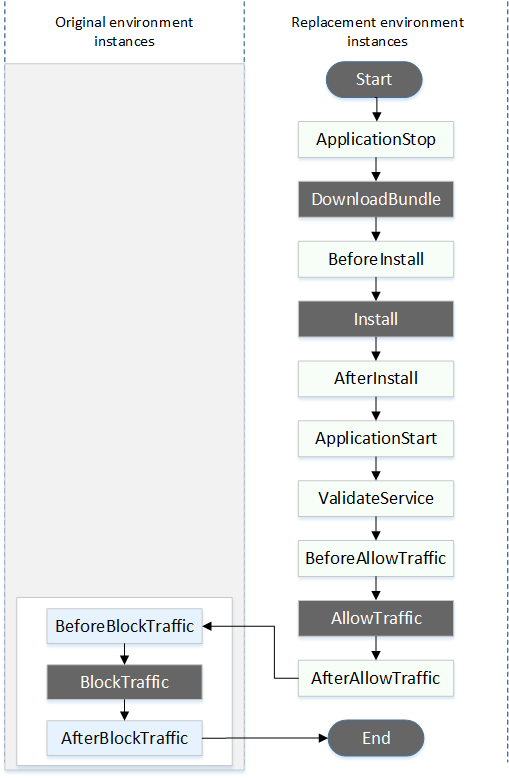 BlockTraffic – During this deployment lifecycle event, internet traffic is blocked from accessing instances that are currently serving traffic. This event is reserved for the CodeDeploy agent and cannot be used to run scripts. AfterBlockTraffic – You can use this deployment lifecycle event to run tasks on instances after they are deregistered from a load balancer. To troubleshoot a deployment that fails during the AfterBlockTraffic deployment lifecycle event, see Troubleshooting failed ApplicationStop, BeforeBlockTraffic, and AfterBlockTraffic deployment lifecycle events. BeforeAllowTraffic – You can use this deployment lifecycle event to run tasks on instances before they are registered with a load balancer. AllowTraffic – During this deployment lifecycle event, internet traffic is allowed to access instances after a deployment. This event is reserved for the CodeDeploy agent and cannot be used to run scripts. AfterAllowTraffic – You can use this deployment lifecycle event to run tasks on instances after they are registered with a load balancer. The following table lists the lifecycle event hooks available for each deployment and rollback scenario. ¹Also applies to the rollback of an in-place deployment. ² Reserved for CodeDeploy operations. Cannot be used to run scripts. For in-place deployments, the six hooks related to blocking and allowing traffic apply only if you specify a Classic Load Balancer, Application Load Balancer, or Network Load Balancer from Elastic Load Balancing in the deployment group. The Start, DownloadBundle, Install, and End events in the deployment cannot be scripted, which is why they appear in gray in this diagram. However, you can edit the 'files' section of the AppSpec file to specify what's installed during the Install event. 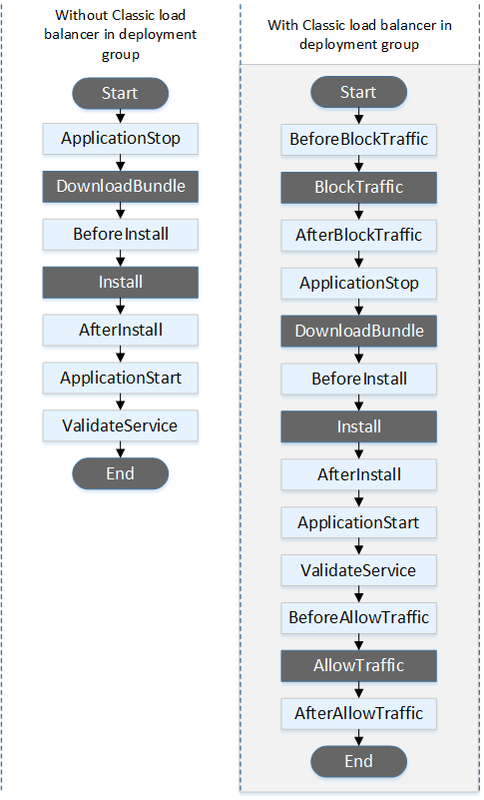 The Start, DownloadBundle, Install, BlockTraffic, AllowTraffic, and End events in the deployment cannot be scripted, which is why they appear in gray in this diagram. However, you can edit the 'files' section of the AppSpec file to specify what's installed during the Install event. Required. The location in the bundle of the script file for the revision. Optional. The number of seconds to allow the script to execute before it is considered to have failed. The default is 3600 seconds (1 hour). 3600 seconds (1 hour) is the maximum amount of time allowed for script execution for each deployment lifecycle event. If scripts exceed this limit, the deployment stops and the deployment to the instance fails. Make sure the total number of seconds specified in timeout for all scripts in each deployment lifecycle event does not exceed this limit. Optional. The user to impersonate when running the script. By default, this is the CodeDeploy agent running on the instance. CodeDeploy does not store passwords, so the user cannot be impersonated if the runas user needs a password. This element applies to Amazon Linux and Ubuntu Server instances only. The name of the application in CodeDeploy that is part of the current deployment (for example, WordPress_App). The ID CodeDeploy has assigned to the current deployment (for example, d-AB1CDEF23). The name of the deployment group in CodeDeploy that is part of the current deployment (for example, WordPress_DepGroup). The ID of the deployment group in CodeDeploy that is part of the current deployment (for example, b1a2189b-dd90-4ef5-8f40-4c1c5EXAMPLE). The name of the current deployment lifecycle event (for example, AfterInstall). These environment variables are local to each deployment lifecycle event. strToSearch="<h2>This application was deployed using CodeDeploy.</h2>"
strToReplace="<h2>This page for "+os.environ['APPLICATION_NAME']+" application and "+os.environ['DEPLOYMENT_GROUP_NAME']+" deployment group with "+os.environ['DEPLOYMENT_GROUP_ID']+" deployment group ID was generated by a "+os.environ['LIFECYCLE_EVENT']+" script during "+os.environ['DEPLOYMENT_ID']+" deployment.</h2>"
The Scripts/RunResourceTests.sh script runs during the AfterInstall stage of the deployment process. The deployment is unsuccessful if it takes the script more than 180 seconds (3 minutes) to run. The location of scripts you specify in the 'hooks' section is relative to the root of the application revision bundle. In the preceding example, a file named RunResourceTests.sh is in a directory named Scripts. The Scripts directory is at the root level of the bundle. For more information, see Plan a Revision for CodeDeploy.